Stenciled handmade paper pulp in 11 grays, 57 1/2 x 40 in. *This exhibition is on view in the main Love, Newman/Wild Galleries through January 5; the portion on view in the Lecture Gallery continues through January 26, 2014. Guide-by-Cell Audio Tour underwritten by Lucy and Nat Day is available for this exhibition. 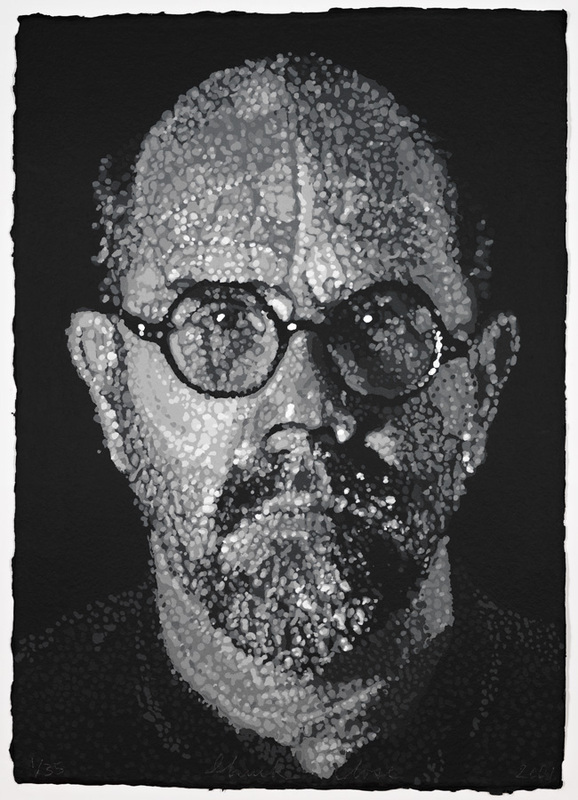 With a body of work composed almost entirely of portraits, the American artist Chuck Close has been astounding us with his artistic verisimilitude for more than four decades. His prints, especially, are adventures in problem solving: working from the particularities of each print medium – woodcut, etching, silkscreen, linocut, aquatint, pulp-paper multiple – he gives his imagination free rein to reconceive their aesthetic possibilities. Although a spirit of experimentation characterizes Close’s work across all media, it is particularly evident in the wide-ranging scope of his printed production. “Any innovation that is evident in my paintings is a direct result of something that happened in the course of making a print,” the artist has said. 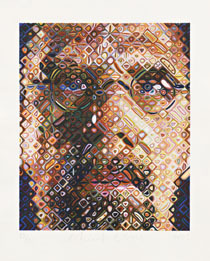 View more Chuck Close images. Close was born on July 5, 1940, in Monroe, Washington. Despite learning disabilities (including dyslexia), he cultivated his artistic talents from a young age. Close attended junior college and the University of Washington, Seattle and then received a BFA and MFA from Yale University in the early 1960s. After a year of study in Austria in 1964-65 on a Fulbright grant and a brief stint teaching art at the University of Massachusetts, Amherst, he moved to New York City in the fall of 1967 to pursue his career while living and working in his SoHo studio. Chuck Close announced his arrival on the contemporary art scene with his large-scale, black-and-white airbrushed heads, paintings based on photographs he had transferred to canvas by means of a grid. Recognition came quickly: his work was shown at the Whitney Museum of American Art, New York, in 1969, followed by a solo exhibition at New York’s Bykert Gallery in 1970 and a one-man show at the Los Angeles County Museum of Art in 1971. In 1972 he created the first print of his professional career, a mezzotint, which began a life-long engagement with the aesthetics and technology of printmaking. The collaborative nature of this work has been vital to the artist’s creative process: working with master printers, Close alters one or several variables to create endless permutations in a wide variety of print techniques, usually recycling past portraits of himself, his family, and his friends. On December 7, 1988, Close suffered a spinal artery collapse, which initially left him paralyzed from the neck down. After arduous rehabilitation, he resumed work with his customary intensity. One of the great modern masters of printmaking, methodical yet always inventive in his approach, Chuck Close continues to follow the bold trajectory he set for himself nearly five decades ago. Guide-by-Cell Audio Tour underwritten by Lucy and Nat Day is available in the museum for this exhibition. Closer: The Graphic Art of Chuck Close is accompanied by a generously illustrated catalogue by the same title. A lecture series and film series will also complement the exhibition. Educational programming is generously underwritten by J.P. Morgan. Chuck Close in the news: Hartford Courant, Greenwich Daily Voice, Art Museum Touring, Its Relevant.